Sundarbans or India’s Amazon Valley is the land of magnificence and beauty. The place got its name from the ubiquitous Sundari trees found in abundance here. The Sundarbans has been formed by the confluence of three rivers, namely, the Ganges, the Meghna and the Brahmaputra and it is a part of the world’s largest delta on the Ganges. The Sunderbans has the distinction of being a UNESCO World Heritage Site because of it being the single largest block of mangrove forest in the world. Covering an area of nearly 26,000 Sq Km (including India and Bangladesh), the Sundarbans is definitely a must-visit place. The Sundarbans was declared as a Protected Forest in the year 1878. In 1928, it was declared a Reserved Forest and it was amongst the first nine Tiger Reserves declared in 1973. It became a wildlife sanctuary in 1977 & On May 4, 1984 it was declared a National Park. While having the largest and the most unique mangrove eco-system of the world, Sundarbans is home to one of the most iconic wildlife species in India, the Royal Bengal Tiger. The Royal Bengal Tigers have developed a unique characteristic of swimming in the saline waters. Hundreds of creeks and tributaries criss-cross the Sundarbans making it one of the largest estuarine forests in the world and is accessible only on boats. For tourists, big motorboats (Motor vehicles as they say there) operate here and have all the facilities on-board like rooms and toilet and can easily accommodate around 20-60 people at a time. Contrary to the common myth of danger due to the presence of man-eating tigers, these boats are 100% safe. Tourists are not allowed to get down from these boats except at the few designated islands that have watchtowers in the fenced areas. The Sundarbans jungle is a freshwater swamp forest. Every 12 hours, high tide inundates the mangroves spread along either side of the network of water channels here. At low tide, one can see expanses of exposed mud ‘flats’. Lying behind the Sundarbans Mangroves, the freshwater eco-region is the area, which becomes fresh during the rainy season. It might not be the best place to see tigers because of hostile environment but it provides the perfect setting for the nature lovers, as it is a complete biosphere where they can pursue animal and bird watching. Sundarbans derived its name from the Sundari Trees. It is a special kind of Mangrove tree, one of the most exquisite varieties found in this area. The unique feature of this tree is that they produce spikes, which grow above the ground. During the monsoons when the forest is water-logged, these spikes having their peaks in the air, helps in the respiration. The jungle although mainly comprises of the mangrove trees, has some other species of plants as well. There are 64 mangrove species in the Sundarbans suited to survive in estuarine conditions and saline inundation that occurs as a result of tidal effects. It is home not only to the Royal Bengal Tiger but some 150 species of fishes, 42 species of mammals, 270 species of birds, 8 amphibian species and 35 species of reptiles are also found here. The rich wildlife is able to thrive in the forest due to the unique ecosystem. The endangered species that lives within the Sundarbans are Royal Bengal Tiger, saltwater crocodile also known as estuarine crocodile, river terrapin, Olive Ridley turtle, Gangetic dolphin, ground turtle, Hawks Bill turtle and Mangrove horseshoe crab.Other animals such as wild boar, leopard cat, fishing cat, macaques, Indian grey mongoose, fox, flying fox, jungle cat, pangolin and chital (spotted deer), reptiles such as monitor lizard, chameleon, king cobra, python, Russell’s viper, rat snake, dog faced water snake and common kraits are found here. Some of the fishes and amphibians found in the park are butter fish, sawfish, electric ray, star fish, silver carp, common carp, prawn, king crab, shrimp, common toad, skipping frog and tree frog. Commonly found birds in this region are open-bill stork, black-capped kingfisher, black-headed ibis, water hen, coot, pheasant-tailed jacana, Pariah kite, Brahminy kite, marsh harrier, swamp partridge, red junglefowl, spotted dove, common mynah, jungle crow, jungle babbler, cotton teal, herring gull, Caspian tern, grey heron, common snipe, wood sandpipers, green pigeon, rose ringed parakeet, paradise-flycatcher, cormorant, grey-headed fish eagle, white-bellied sea eagle, seagull, common kingfisher, Peregrine falcon, woodpecker, whimbrel, black-tailed godwit, little stint, eastern knot, curlew, golden plover, northern pintail, white-eyed pochard and whistling teal. The climate in Sunderbans is generally pleasant with neither too hot nor too cold. Average temperature in Sunderbans ranges from 34 °C to 20 °C. The weather is almost always moist with humid air blowing constantly from Bay of Bengal. Due its close proximity to sea, a cool sea breeze blows during night and thus the temperature is favorable all along the day. Summers are hot with maximum temperature going up to 42 and min temperature around 20°C. These months offer heavy rainfalls. It is not a good time for visiting this wildlife sanctuary. Winters are pleasant with temperature going down up to 9°C and going maximum up to 32°C. As a species, Royal Bengal Tigers of Sundarbans are not different from tigers present in other parks of India. However owing to hostile ecological and riverine conditions, tigers have evolved different habits from the tigers of other forests of India. They are good swimmers, drink saline water, agile and eat anything from fish, crabs, wild boars, chital, monitor lizard etc. Their size is smaller compared to tigers of other regions, as they have to work hard to satisfy their needs and for that they have to travel from one island to another. Sometimes they even swim for 3-4 kms at a stretch. And don’t forget that Sundarbans is a swampy land, even walking is difficult for any animal. Tigers of Sundarbans are very shy in comparison to other parks. It’s a dream of many wildlife photographers to capture tiger on the banks of mud flats in the backdrop of mangrove forest or while crossing the water channels. The park is open throughout the year, but ideal time to visit is from October to March as weather is favorable. October – A good month to be in Sundarbans. The migration starts and mud banks are full of curlews, golden plovers, whimbrels and sand pipers. 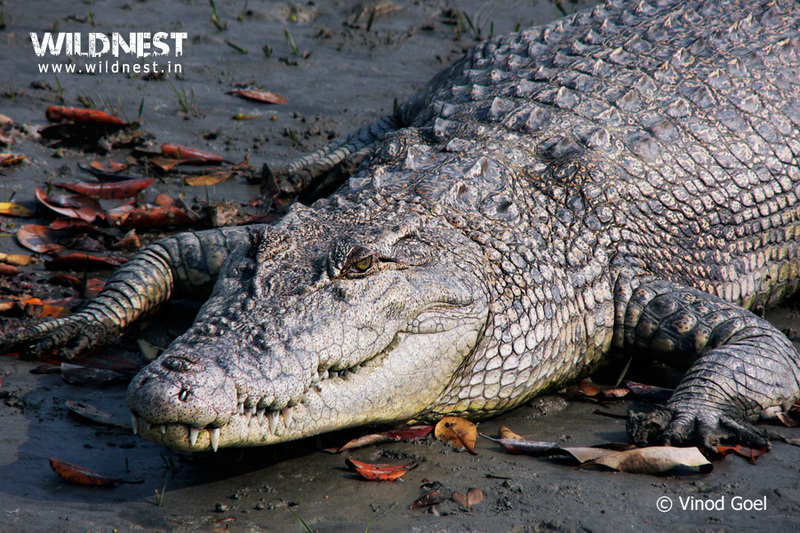 Nov-Feb – the weather is pleasantly cool and this is the best time to see estuarine crocodile on the mud banks as they bask in the sun to get energy. As the water temperature rises, sightings of estuarine crocodile get reduced. A large number of birds including migratory birds are seen and can be photographed during this period. Month of March is good for visiting Sundarbans. During April and May weather is sultry and humid. Honey collection starts in 1st week of April. This event can be captured, as large no. of small boats with honey collectors gather at Sajnekhali and from there move to different areas of the park. After collecting honey from jungle, they hand it over to the forest authorities and get remuneration for their goods. June-Sep – Rains arrive in June and lasts till September. During cloudy weather, photography of landscape during dawn and dusk can be classic but risky on account of storms. Sundarbans is the World’s largest mangrove forest (Mangroves are trees of various species and several families which can survive, grow and propagate in sea water or swampy brackish water and alluvial soil in a tidal zone) What makes this tiger reserve different from others is that for viewing flora and one has to travel by mechanized boats known as launches, whereas in other tiger reserves gypsy is the main mode of jungle safaris. Sunderbans is accessible only by waterway. Gadhkali is the main jetty point. As, it is the most convenient jetty point to reach Sajnekhali Interpretation Center, Forest department tourism office, Watch tower and resorts located on island opposite to Sajnekhali. One has to take a boat from there, which takes around two hours to reach Sunderbans. Below mentioned jetty points from Kolkata are at a distance of: Gadhkali (112 km), Namkhana (105 km), Sonakhali (100 km), Raidighi (76 km), Canning (64 km), Najat (92 km). The nearest railway station is at Canning (48 km) away and Kolkata (112 km) away. One can travel by road from Kolkata to the nearest jetty or alternatively take a train to Canning and take a taxi from there to the jetty point. Nearest airport is at Kolkata (112 km) around three hours away from Gadhkali Jetty.